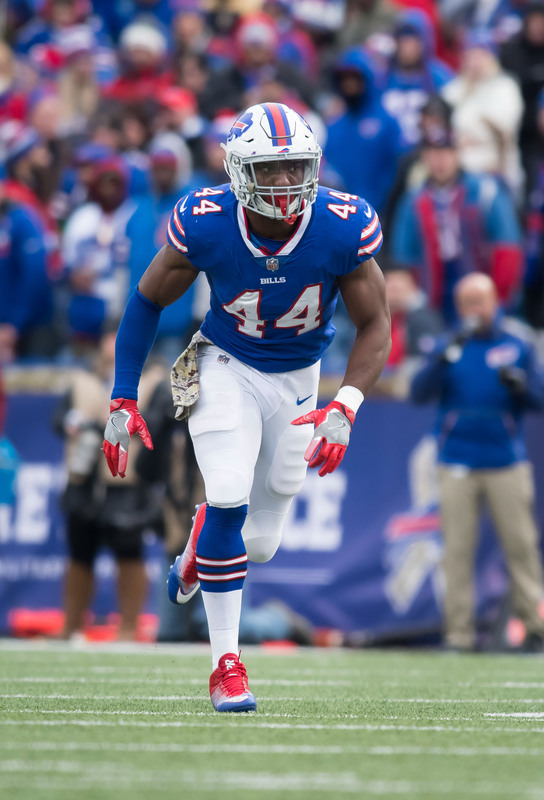 The Bills have re-signed linebacker Deon Lacey to a one-year contract, as Mike Rodak of ESPN.com tweets. The team also confirmed the move via press release. Earlier this month, the Bills signed Lorenzo Alexander to a new one-year deal, inked offensive lineman Jeremiah Sirles to a fresh one-year pact, and locked down long snapper Reid Ferguson. By the time March 13 rolls around, the Bills should have a simplified to-do list that will allow them to focus mostly on the open market and the April draft. A prominent Dolphins front office executive has been telling people that the Dolphins have a future Hall of Fame tackle in Laremy Tunsil, a source tells Jackson. If Tunsil’s immediate future is at the tackle position, that could prompt the team to shuffle some things on the O-Line. The Dolphins have not indicated to left tackle Branden Albert that he will be released, but they have been non-committal about whether Tunsil will move to the outside in 2017. Albert would carry a $10.6MM cap hit if he’s on the team in 2017 but he’d only be on the books for $3.4MM if he’s cut or traded. Last year, Albert had a career-worst 42.2 score on Pro Football Focus. He also missed four games due to injury. An “associate” of Kenny Stills says the wide receiver likes the West Coast and an offer from an AFC West or NFC West team could be attractive. At the same time, both Stills and the Fins have expressed interest in a reunion. Stills figures to be a popular guy if he reaches the open market in March and the Eagles reportedly are among the teams eyeing him. The agent for linebacker Deon Lacey claims the Dolphins have such high regard for his client that they told him he can compete for a starting job. Of course, as a reserve/futures signee, he’ll first have to make the team. The agent said 12 teams, including the Patriots, made offers on the former CFL standout. Drew Brees does not expect to be playing for a different Saints coach in 2017 despite Sean Payton‘s name again being a constant in the coaching rumors section of the NFL news cycle. The quarterback who signed a one-year extension just before this season “absolutely” expects Payton to stay in New Orleans for what would be his 12th year with the franchise. Payton has been connected with the Rams after a report emerged indicating the 52-year-old having “sincere interest” in acquiring the veteran coach in a trade. A report pegged the Saints as being open to exploring a Payton trade, with another denying the team was thinking of shopping him. The Saints have made the playoffs just once in the past five seasons, although the 2012 absence came without Payton due to the Bountygate suspension. Here’s more from the NFC as teams make Week 17 preparations. Saints outside linebacker Michael Mauti underwent surgery for a large intestine issue, leading to the Saints placing the fourth-year player on their NFI list in November. But the Penn State product revealed he hopes to play in 2017, Katzenstein reports. The Saints tried out linebackers Frank Beltre and Deon Lacey, a source tells Nick Underhill of The Advocate (on Twitter). Earlier today, they signed linebacker Brian Blechen to their practice squad. Carlos Hyde described the MCL sprain he sustained as being worse than the one that sidelined him at Ohio State in 2012, Cam Inman of the San Jose Mercury News reports. The 49ers‘ backfield starter will enter a contract year in 2017. He’s expected to return, injury problems notwithstanding, but Inman projects Trent Baalke and DC Jim O’Neil to be fired at season’s end. However, the reporter expects Chip Kelly and OC Curtis Modkins to stay, citing some sense of continuity is needed to avoid having four head coaches in four years. Inman also anticipates none of the 49ers’ three quarterbacks to be back but points to both Torrey Smith and Jeremy Kerley staying in what should be a turbulent offseason. Tyron Smith expects to be ready to go by the time the Cowboys are due to play their divisional playoff game, Clarence Hill of the Fort Worth Star-Telegram reports. The cornerstone left tackle said he did not have knee problems before spraining an MCL on Monday night. After drafting wideouts the past two years, the Redskins figure to let DeSean Jackson walk, Elliot Shorr-Parks of NJ.com reports. This would open the door for the deep threat to reunite with former teammates on the receiver-starved Eagles. This would make sense from a need standpoint, and there have been multiple connections between D-Jax and his former team, but Philly is projected to be $800K-plus over the cap in 2017 after signing numerous players to extensions this offseason. The Eagles would need to shed salary to make room for Jackson. For his part, the 30-year-old wideout said he’s “intrigued” about being a free agent.